get your standard enclosure at short term. Cover and sides of body have smooth #4 brushed finish. Finish : Cover and sides of body have smooth #4 brushed finish. Enclosures are unpainted. Front, sides, top and back have smooth #4 brushed finish. Optional mild steel panels are painted white. Optional conductive panels are available. Finish : Enclosures are unpainted. Front, sides, top and back have smooth #4 brushed finish. Optional mild steel panels are painted white. Optional conductive panels are available. Cover and body have smooth #4 brushed finish. Finish : Cover and body have smooth #4 brushed finish. Cover and body have smooth brushed #4 finish. Finish : Cover and body have smooth brushed #4 finish. Cover and sides of body have a smooth #4 brushed finish. Finish : Cover and sides of body have a smooth #4 brushed finish. Covers and sides of body have a smooth #4 brushed finish. Finish : Covers and sides of body have a smooth #4 brushed finish. Door and body have a smooth #3 brushed finish. Finish : Door and body have a smooth #3 brushed finish. Door and body have smooth #3 brushed finish. Finish : Door and body have smooth #3 brushed finish. Enclosures are unpainted. Cover, sides, top and bottom have smooth #4 brushed finish. Finish : Enclosures are unpainted. Cover, sides, top and bottom have smooth #4 brushed finish. Enclosures are unpainted. Cover, sides, top and bottom have smooth #4 brushed finish. Optional steel panels, swing-out panels, side-mounted panels, rack-mounting frames, heavy-duty panel supports and center panel supports are painted white. Optional full, half and side-mounted conductive panels are available. Finish : Enclosures are unpainted. Cover, sides, top and bottom have smooth #4 brushed finish. Optional steel panels, swing-out panels, side-mounted panels, rack-mounting frames, heavy-duty panel supports and center panel supports are painted white. Optional full, half and side-mounted conductive panels are available. Enclosures are unpainted. Door fronts have smooth brushed finish. Finish : Enclosures are unpainted. Door fronts have smooth brushed finish. Enclosures are unpainted. Front, sides, top and back have smooth #4 brushed finish. Optional steel panels, swing-out panels, side-mounted panels, rack-mounting frames, heavy-duty panel supports and center panel supports are painted white. Optional full, half and side-mounted conductive panels are available. Finish : Enclosures are unpainted. Front, sides, top and back have smooth #4 brushed finish. Optional steel panels, swing-out panels, side-mounted panels, rack-mounting frames, heavy-duty panel supports and center panel supports are painted white. Optional full, half and side-mounted conductive panels are available. Enclosures are unpainted. Front, sides, top and back have smooth #4 brushed finished. Optional mild steel panels are painted white. Optional conductive panels are available. Finish : Enclosures are unpainted. Front, sides, top and back have smooth #4 brushed finished. Optional mild steel panels are painted white. Optional conductive panels are available. External surfaces have a #4 brushed finish. Finish : External surfaces have a #4 brushed finish. Stainless steel enclosures are unpainted. External surfaces have a #4 brushed finish. Optional mild steel panels are painted white. Optional conductive panels are available. Finish : Stainless steel enclosures are unpainted. External surfaces have a #4 brushed finish. Optional mild steel panels are painted white. Optional conductive panels are available. Stainless steel enclosures are unpainted. External surfaces of front, sides, top and bottom have a #4 finish. Interior welds are not finished. Optional mild steel back panels are painted white. Optional conductive back panels are available. Finish : Stainless steel enclosures are unpainted. External surfaces of front, sides, top and bottom have a #4 finish. Interior welds are not finished. Optional mild steel back panels are painted white. Optional conductive back panels are available. Stainless steel enclosures are unpainted. External surfaces of front, sides, top and bottom have a #4 finish. Interior welds are not finished. Optional mild steel panels are painted white. Optional conductive panels are available. Finish : Stainless steel enclosures are unpainted. External surfaces of front, sides, top and bottom have a #4 finish. Interior welds are not finished. Optional mild steel panels are painted white. Optional conductive panels are available. Type 304 stainless steel with #4 brushed finish. Back is not brushed. Finish : Type 304 stainless steel with #4 brushed finish. Back is not brushed. Specially designed enclosures for applications in Food & Beverage, Pharmaceutical, and Oil & Gas, etc. 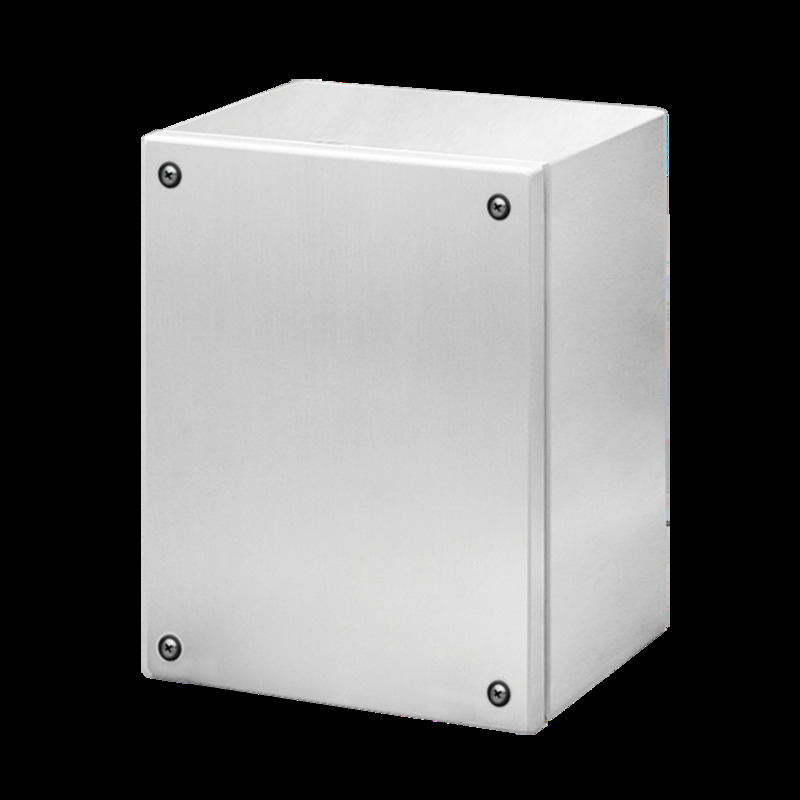 GL66 Series stainless steel enclosures are designed for indoor or outdoor applications that require corrosion protection against chemicals and water. GL66 enclosures feature streamlined styling with a stroked finish and 3mm double bit quarter-turn latches for secure closure. For diverse applications, enclosures are available in hinged and screw cover models. GL66 enclosures also offer flexible internal mounting options, ranging from variable depth back panels to DIN-rail mounting provisions. HOFFMAN mild steel wall-mount enclosures are designed to house and protect electrical and electronic components in industrial environments. An ergonomic and aesthetic styling together with a gray finish make this solution an excellent choice when style and functionality are important. 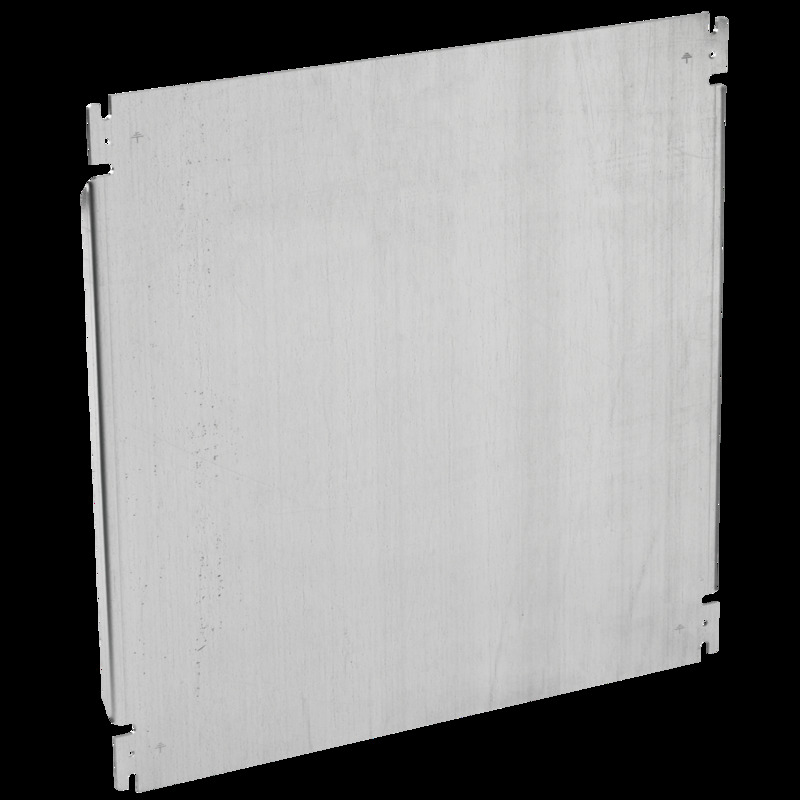 All types of wall-mount enclosures have an outward formed flange to prevent contaminants from entering the enclosure. Top sun shield can be mounted at the top of the body after drilling holes in enclosure. Mounting hardware included. Panels are 2.0 or 2.5mm steel with conductive finish. Grounding marks are punched. Sized for M8 fastener. Aesthetic styling, flush latches and an attractive, stroked finish make InLine Enclosures an excellent choice when style and functionality are important. InLine Enclosures have an outward formed body flange to prevent contaminants from entering the enclosure and are available in three cover styles: hinged window door, hinged solid door and solid screw cover. Used in either indoor or outdoor applications, these enclosures combine a rugged continuous hinge, seamless foam-in-place gasket and stainless steel screw-down clamps for a reliable seal that protects components from corrosive environments. These two-door enclosures provide industry-leading protection for large components or complex mounting configurations in highlycorrosive environments. Three-point latching with the Hoffman PowerGlide padlocking handles and a foam-in-place gasket combine convenience with security. They are well-suited for use in petrochemical plants; pulp and paper processing; water treatment facilities; and food, pharmaceutical and packaging applications. The Hoffman WaterShed stainless steel free-stand enclosure, with its unique design and Type 4X rating, is a perfect fit for mounting electrical or high-tech electronic equipment in a variety of indoor and outdoor settings. Its unique features are specifically designed for use in sanitary washdown production environments like food, beverage, or pharmaceutical processing. These enclosures feature nVent HOFFMAN's exclusive PowerGlide Handle with 3-point latching, ideal for indoor or outdoor applications that require corrosion protection, convenient access, and padlocking security. Punched specifically to house either 30.5-mm or 22.5-mm oil-tight pushbuttons, switches and pilot lights. Enclosures provide protection against dirt, dust, oil and water. See Mild Steel chapter for related mild steel enclosures.